Eragon is an epic fantasy-adventure movie based on the novel of the same name by author Christopher Paolini, which is the first book of the Inheritance Trilogy. Eragon movie is centered on a young farm boy named Eragon in his homeland of Alagaesia, where he finds a dragon’s egg. It’s a discovery that changes his destiny and leads him on a predestined journey to defend his home against an evil king. The movie is scheduled to be released on December 15, 2006 by 20th Century Fox. 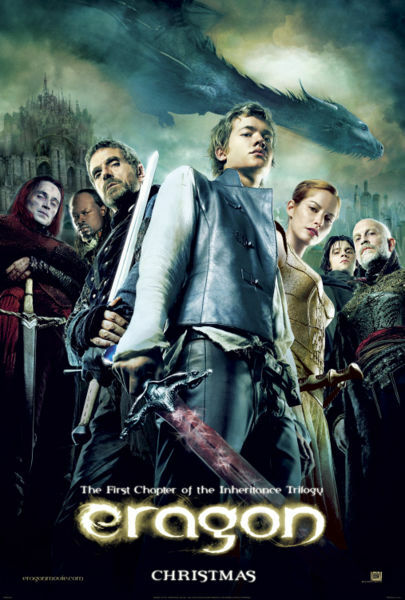 Eragon casts include Edward Speleers as Eragon, Jeremy Irons as Brom, John Malkovich as Galbatorix, Robert Carlyle as Durza, Sienna Guillory as Arya, Djimon Hounsou as Ajihad and Joss Stone as Angela. The first official trailer for Eragon movie. This trailer has lots of action scenes. International trailer for Eragon movie. A promo video and preview of Eragon movie with introduction to cast, plot, storyline and the making of Eragon plus interview with director video clip. From the visuals of the movie trailers, you can certainly expect the comparison and similarity to Lords of the Rings trilogy and Harry Porter series. This entry was posted on Sunday, October 8th, 2006 at 4:14 am	and is filed under Movie Trailer. You can leave a response, or trackback from your own site.